The cute faces drawn on the pies immediately grabbed my attention when I first saw it on Instagram (@Evilbean). I like to devour and deface cute things (like chewing off the heads of gingerbread man and gummy bears), so this was one of the Evilbean's "Must Kill Food Item" for a long time. The latte is actually pretty good with a light caramel finish! It is the perfect accompaniment to the pies because of its light body, which will bring out the taste of the fluffy, buttery pie crust. I also like how photogenic the cup of latte is against the backdrop of the cafe! Let's say you decided to takeaway a few pies back home to enjoy them on your sofa. To your horror, you don't know which flavour is which! HOW!? Evilbean is here to save your pie-day - simply just look at their mouth shape! Their mouth shape actually depicts their flavours! I have to first comment on the puff pastry. The dough of the French puff pastry takes THREE days to prepare, and the kitchen team is required to fold to create 48 layers. FORTY EIGHT! My first bite into the pie was so satisfying! As the layers crumbled under my teeth, I literally felt the aromatic blend of butter spread in my mouth. The flaky, buttery pastry crust of Pie Face deserves a #4evilbeans rating on its own! Out of all the flavours, which are the best in my opinion? 1. Chunky Steak Pie (Mouth shaped like a S) - My favourite flavour is also the crown jewel in Pie's Face array. Encased in the pie are chunks of beef braised with onions, garlic and gravy. OH THE GRAVY IS SO GOOD.. The beef chunks are also 100% aussie cows, and we all know aussie beef rarely disappoints. 2. Chicken & Mushroom Pie (Mouth shaped like a C) - Although chicken breast is used in this pie, it is skillfully cooked to ensure its tenderness. The rich creamy gravy of mushroom and garlic goes very well with a sip of coffee. Your stomach will thank you for the combination. 3. Thai Chicken Curry Pie (Mouth shaped like an O) - Chicken meat, carrots, onion, garlic and coconut milk lives under the golden crust of this Thai Chicken Curry pie. This flavour will be very familiar to all Thai food enthusiast! "The Stack" is an addon option available only for dine-in. For an additional $2, the pie faces are smashed with mashed potatoes, peas and a scoop of gravy. Order this for the Ultimate Pie Experience (because you will be damn full after that)! Besides the Pies, Pie Faces also have 4 assorted rolls for you to choose from. The Chicken & Cheese Sausage Roll is a very interesting combination of both savoury and sweet. It is a good afternoon snack to munch on, for those times when you are falling asleep in the office or when your lecturer is too boring. I tried all 8 flavours, and here's my top 3! 1. Apple Crumble - Who doesn't like Apple crumbles? TELL ME, WHO? 2. Chocolate Pie - Rich chocolate mousse is drizzled on a crisp chocolate shell, encased in a sweet crust pastry. I really liked the richness of the chocolate mousse, and to my surprise, it wasn't overwhelmingly sweet! 3. Butterscotch Pie - The butterscotch flavour comes out strong, but when paired with the pastry, it is an explosion of buttery goodness on your tongue! If you like strong flavours like me, you would love this! This drink is a match made in heaven for that heavy, after-gobbling-up-all-the-pies feeling. The refreshing sizzling sensation of the sparkling water and the light floral taste of earl grey instantly rejuvenates your palettes. In Evilbean's opinion, this is a MUST TRY if you are looking for something interesting to wash down the pies! 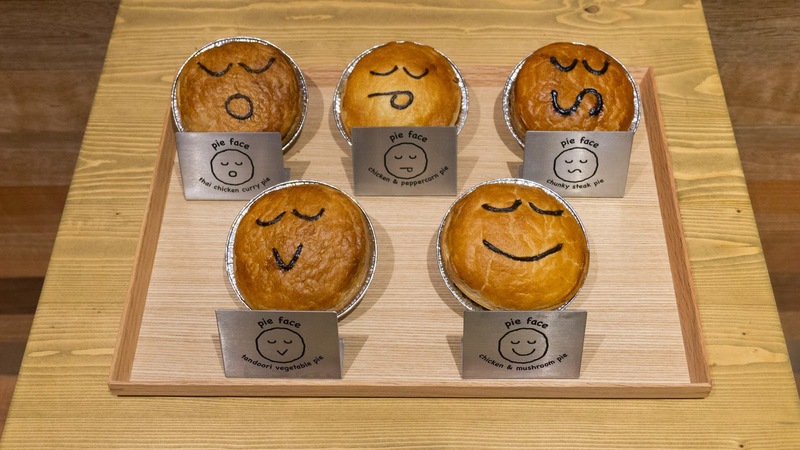 - Great flaky buttery pies, huge spaces and pretty backdrops make Pie Face an interesting cafe to visit and not to forget, taking selfies with the pie faces! Thank you Jaslyn for the invite! 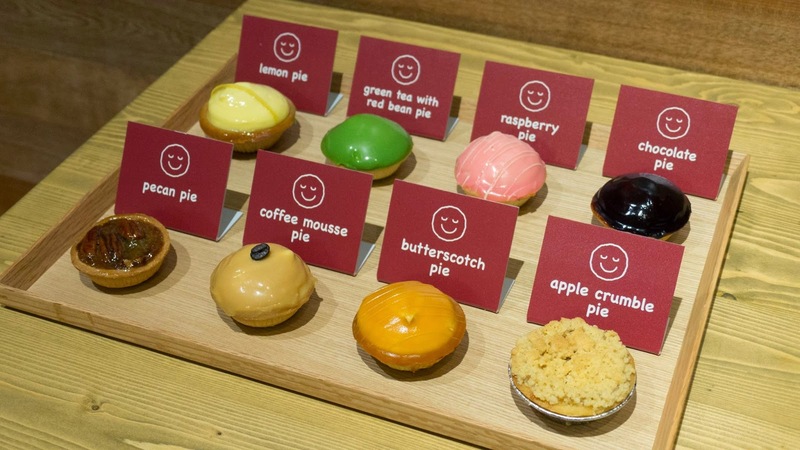 Do follow Pie Face at their Facebook page to get the latest deals and contests on their pies!